Many owners of ceramic charcoal cookers have replaced factory gaskets with various replacement gasket materials when the original gaskets fail. However, there have been concerns raised about the safety of using these other gaskets on ceramic charcoal cookers. Where did all the concern come from? Posters on ceramic charcoal cooker bulletin boards have posted that they were told, either by Rutland or by the manufacturer of their cooker, that the Rutland gasket is not safe for use around food. At various times, posters have indicated that Cotronics has said not to use their product, and then said it was alright to user their product. As result, there have been numerous arguments, sometimes heated, on these bulletin boards about the safety of using various non-original gasket materials on ceramic charcoal cookers. We have done our best to provide you with the information we have been able to accumulate on the subject in two previous articles about Rutland and Cotronics safety information, so you can make an informed decision as to whether or not you wish to use this product on your ceramic charcoal cooker. 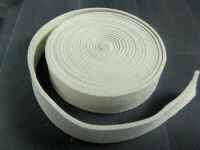 We don't claim to know if it is safe or not for you to use a Nomex gasket product on your ceramic cooker. Any opinions stated here are just that, opinions. It is up to you to evaluate the information presented here and make your own decision as to whether or not you wish to use Nomex gasket material on your cooker. "We do not have an authorized statement for the use of Nomex� around food. Nomex� is not FDA approved." Since the product is not intended to be used around food, they have not conducted any testing related to the use of Nomex around food. No testing means no safety data, so they have no statement to make regarding the safety of using Nomex around food. Nomex is not FDA approved, which probably means you might not be able to use it in a commercial application, but we aren't talking about that. Sounds pretty similar to what Rutland said, doesn't it? Notice that unlike Rutland, DuPont does not make the "we do not recommend it since we have no data" statement. So, where does this leave us? Since DuPont's brief statement didn't contain any information regarding the safety of using their product around food, we can look to some other sources of information. DuPont has published a Material Safety Data Sheet (MSDS) and a Technical Guide for their product. Decomposition : Decomposition temperature : > 300° C (> 572° F) Hazardous decomposition products Carbon monoxide, nitrogen oxides (NOx), Hydrogen cyanide (hydrocyanic acid). So, apparently exposure to temperatures above 572° F can release Hydrogen Cyanide. This is certainly possible when using a ceramic charcoal cooker, but there is more information about this in the next section from the Information Guide. The hazards of this product are associated mainly with its processing. Dust may form explosive mixture in air. High concentrations of dust can irritate eyes, nose and respiratory system and cause coughing and sneezing. Processing meta-aramid products can release Dimethyl Acetamide (DMAC). Hazards related to DMAC include: May be harmful by inhalation (after often repeated exposure). May be harmful in contact with skin (after often repeated exposure). Liver and kidney injuries may occur. So, no food safety information, but also no indication that casual usage should be a problem either as the hazards outlined are primarily associated with processing Nomex, not using it. There is more information in the Nomex Technical Guide. When NOMEX� is subjected to flame or intense heat, it is converted to the usual combustion products for substances of the same elemental composition: carbon dioxide, water and oxides of nitrogen. However, carbon monoxide, small amounts of hydrogen cyanide and various other chemical residues (some possibly toxic or irritating) may be produced, depending on the conditions of burning. In small-scale evaluations, combustion products from NOMEX� appear to have similar toxicity as smoke from burning wood and other natural, combustible materials. The fiber contains up to 12% moisture (depending upon storage and use conditions) and a small amount of residual dimethylacetamide (DMAC) from the manufacturing process. However, there is no further information beyond what the MSDS provided. "The absorption spectrum of Nomex overlaps with the energy spectrum produced by natural sunlight in the near-UV and lower visible regions. Nomex absorbs its maximum energy at the high end of the UV spectrum (approximately 360 nanometers), where the relative intensity of the UV component of most light sources is greatest. To make a long story short, Nomex will lose approximately 50% of its mechanical strength with 80 hours of exposure to UV light. This doesn't sound like a problem for ceramic cookers, but it is something to consider as none of the other gasket materials we have examined suffer from this effect. DuPont has made no data available as to the safety of using Nomex products around food. DuPont also does not say that such use is unsafe. In fact, they say nothing other than to point out that Nomex is not FDA approved. DuPont therefore also does not recommend against using Nomex in this application. The possibility of producing hydrogen cyanide is not a significant concern as burning wood will also produce hydrogen cyanide. The presence of N,N-dimethylacetamide doesn't appear to be a problem as the quantity present is low enough that significant quantities should not be released to produce the health hazards listed in the MSDS when using Nomex in a ceramic cooker. So, it is our personal opinion that there is no significant level of risk associated with using the Nomex gasket in a ceramic charcoal cooker. But, as we have stated, you should evaluate the available information and draw your own conclusions.